But that's a story for another day. 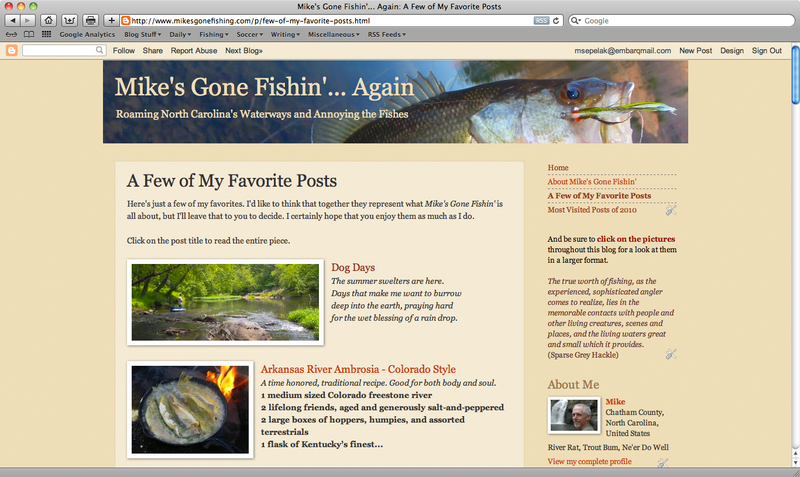 In the meantime, fishing opportunities, and blogging about them, will suffer mightily - as, no doubt, will my sanity. So, to try to keep a little interest going here, I am going to queue up a series of my personal favorite posts from the past three years to be offered daily over the next week-and-a-half or so. End of summer reruns, if you will. Some of them you may remember, some you may not, depending on how long you've been around. I think I'll start oldest first so you can watch the evolution of this blog. Assuming, of course, that it actually has evolved. If you are feeling anxious, you can get a preview of the posts I'll rerun on my A Few of My Favorite Posts page. You can read them all at once there, too, but that would ruin the coming days' rollout. Wouldn't it? I hope to be back on the stream, regaining my sanity, by the first of the month. And, with luck, I'll be back posting from a new desk, with a new view, but with the same ol'e perspective shortly thereafter. I look forward to being settled once more. So I'll see you again real soon. In the meantime, enjoy the reruns and the arrival of fall. "Someplace really good"....glad to hear this. I hope you don't suffer to much in moving to someplace really good. I was looking forward to visiting that place of yours!! Don't worry, Ro. When you get here you won't be disappointed. OK... spill it. We gonna be neighbors?